SEOUL, Nov. 13 (Yonhap) — The cumulative number of moviegoers in South Korea dwindled 34.8 percent in October from a year before as the long fall harvest holiday fell a month earlier this year. Movie theaters logged a total of 14.07 million admissions last month, down 34.8 percent from 2017, with their sales falling 31.6 percent to 119.6 billion won (US$105.69 million), according to a monthly report from the Korean Film Council. The council attributed the sharp drop in attendance to last year’s unusually strong performance backed by the up to 10 day-long Chuseok holiday. Chuseok, or the Korean Thanksgiving holiday, falls on Aug. 15 on the lunar calendar. This year, the holiday fell in September, bringing the month’s audience total to 16.81 million. 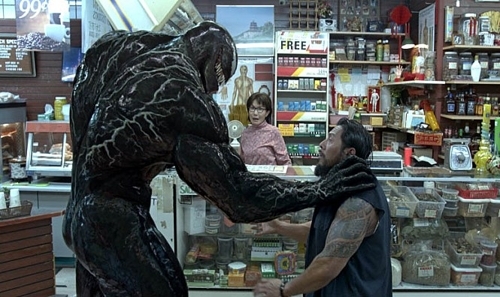 In October, Hollywood superhero movie “Venom” was the most-viewed title with 3.88 million views, with Korean crime thriller “Dark Figure of Crime” in close second with 3.74 million. The Korean period zombie actioner “Rampant,” which opened on Sept. 25, came in third, drawing 1.31 million moviegoers after seven days of release. As the cumulative reached only 1.56 million until Nov. 7, industry experts predict that it would be practically difficult for the film to gather 3.8 million admissions to break even. “October was a traditionally low season for the local film market in the past, so many medium and small-budget movies have aimed to hit the box office during the season,” the KOFIC report said. But many big-budget movies jumped into an overheated race to win the office last month, and “Rampant” was one of them, it said. “More and more big-budget films these days fail to break even due to their repeated use of elements proved successful in previous films,” it added.